These intermediate backpacking tips are offered as simple, easy ways to get stronger as a hiker, and to hike smarter on your next backpacking trip. You're self selecting into the intermediate category of backpackers. Maybe you feel like you've learned a ton about backpacking already, but have more to learn. Maybe you've identified some trail problems to solve. No harm, no foul if you're a beginner backpacker sneaking a peek at intermediate backpacking tips! If you're more interested in seeing the wide range of beginner backpacking tips, or want to learn some new foundational strategies as a backpacker, start here. Or try these backpacking tips for women for something new (to you) to try on your next adventure, regardless of which type of hiking you're doing. As you already know, it takes time before you get the hang of the whole backpacking thing. Planning, preparing, executing and recovering from backpacking adventures requires a linear, logical, rational investment of your time and money in your personal health and safety. Nothing on Hiking For Her is intended as medical advice or "must do" demands. You're marrying this backpacking information with your own judgment, common sense and experience, of course. 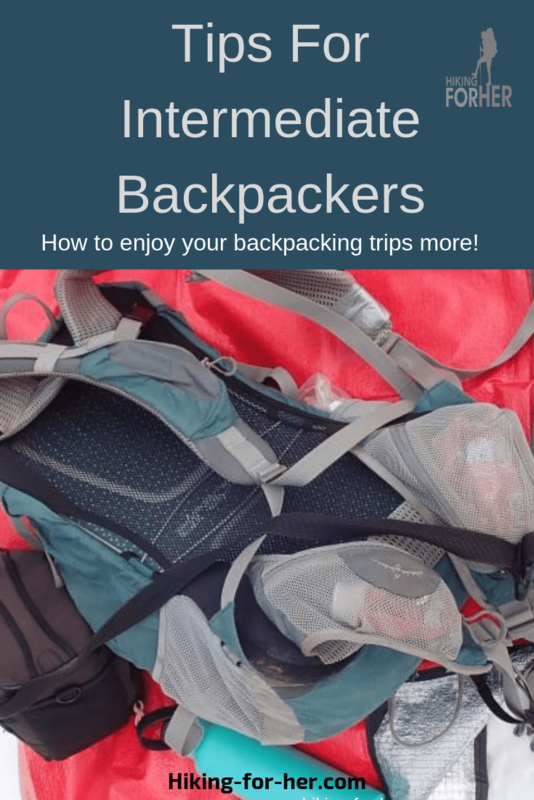 These intermediate backpacking tips are organized into categories to make it easy to hone in on the tips you need as a backpacker working on improving your outdoor skills. We'll start with some backpacking fundamentals which every backpacker needs to get right. This first category of intermediate backpacking tips covers shelter, food, communication, navigation and basic safety. Survival means you're going to make it through unexpected events because you're prepared. Planning a backpacking trip goes beyond the basic goal of living another day so you get back to the trailhead, though. Let's look at some real life examples. When it snows in July, you're not flustered, because you're prepared for unexpected weather events. If you fall and get injured, have to cross a river due to a bridge washout, or face other uncertainties, you know what to do while a newbie backpacker might be in trouble. Should you or your trail buddies wander off the trail, no worries! (Okay, maybe a few worries but nothing like a newbie backpacker would go through). You've learned over your previous backpacking trips that eating for the trail is an important fact of life as a seasoned backpacker. But it's about way more than taste and quantity when selecting the right backpacking food. You've got to pay attention to calories, carbohydrates, protein, fats, hydration, and so much more. Would you agree that enough calories of the Big 3 nutrients, in palatable flavors and easy to prepare portions, is a survival item on a long backpacking trip? By now, you've got your personal version of an essential backpacking checklist. As a backpacker with some trail mud on your boots, you don't have to be convinced about wearing the best outdoor clothing, trail footwear, and weather protective pants, jackets and hats. But you can always learn more, right? Try these tips for the best backpacking equipment and clothing. Have you considered this essential information for keeping yourself safe and mobile on the trail? Now for the third category of our intermediate backpacking tips. Experienced backpackers like you have already figured out what brings comfort and happiness when you're outdoors for days at a time. Or at least you've noted the absence of a few items that could have really made a difference on the trail. Now that we've covered three big categories of tips for intermediate backpackers, here are two questions for you. Looking to stretch yourself as a backpacker? Have a list of "must do" backpacking trips or destinations? Oh, the places you'll be able to go when you're ready for a challenge! If you didn't see an answer to your specific question, or want to suggest a topic for inclusion in these backpacking tips for non-beginners, contact me. 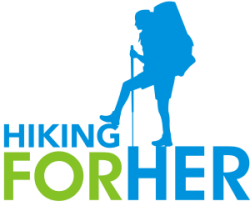 Hiking For Her's mission is to get you on the trail, prepared and ready on all levels for the best backpacking trips of your life. And why not work on perfecting your day hiking technique, too. Every hike you take makes you stronger, smarter and happier.